Horus, the falcon god. Doesn't he look just like a little man?! Correction. Peter, my husband, read my post from yesterday and reminded me that the pharaohs buried in the Valley of the Kings are from the New Kingdom (between the 16th and 11th centuries, BC), and not from the Middle Kingdom. I've made some new friends on this trip! Claudia and her husband Burkhard, who are really friendly and even live near Cologne. Claudia tells me that she is also from another country. She came to Germany from Poland when she was fourteen. That must explain her accent, which I can't quite place. It's early morning and I've done the salicylic acid face washing thing and the sinus wash. I'm doing OK, but Peter and I are the last ones down to breakfast. Ah, there are two spaces free at Claudia and Burkhard's table! But I have to sit next to Icicle Eyes. Oh well, we'll find something to talk about. She tells me her name is Astrid. Does that mean I'm going to have to call her "du"? But she's not a "du" for me - she's a "Sie"! But what will she think when I call Claudia "du"? We've already gone through the ceremony. This is a problem I only encounter with educated, "cultured" Germans. In church, we're all "du", no matter how much or little education we've had. The same thing wherever I teach. There's another couple at the table. The woman is already talking about filling in their evaluation forms. They're going to give Mohammed a negative point because he hasn't thoroughly explained how much bakshish to give whom. The personnel also gets a demerit because the towels - well - you should see them! They are not clean! No, not at all. They have spots! That will never do for a luxury liner. And the bathrobes. This lady has never seen anything so gray, so worn. Claudia and I both utter in unison, "I didn't even know we had bathrobes!" Nor have I noticed any spots. 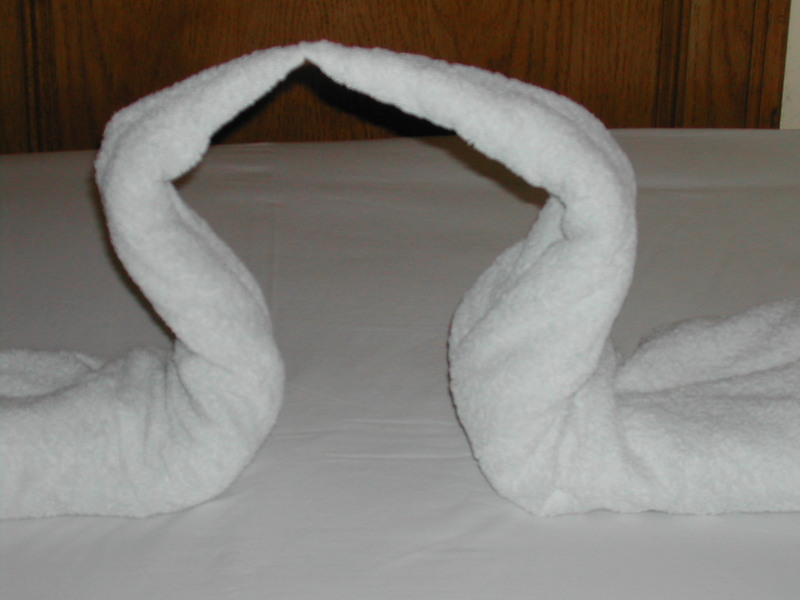 What Peter and I have noticed is that when we returned to our rooms yesterday, my bed had two bath towels wrapped and twisted in the shape of swans - or possibly the white egrets we see every day on the river. We are charmed by the sweet attention of a male. There are no women working on this ship. I remind myself to give everyone a good evaluation. I have no complaints. I'm having the time of my life. We've been travelling south all night, crossing through the locks at Esna at 11 pm. We've spent the evening sitting on the sundeck, waiting for our turn to pass through. Someone jokes, "Our ship didn't give enough bakshish!" We've been entertained for hours by two men and a young boy in a small rowboat, treading water with us as we wait. "Lady! Lady!" a man calls. "Beautiful dresses!" He aims a loaded plastic bag for the sundeck. Splat! It lands perfectly. "That's way too much!" We laugh and banter with them. What shall we do with the beautiful dress on deck? Throw it back? Before we've decided, another bag lands at our feet. This time we see a beautiful red shawl, reminscent of a Persian carpet. Claudia has another new friend, Anja. "That would make a beautiful comforter when you're watching TV," Anja says. I ask the man, "How much?" "Too much." But I have something to think about buying. This time Claudia tries to throw it back to them with money for the dress she has decided to buy. They've agreed on a price. The bag lands in the water. Off they row, in pursuit of shawl and precious money. Now we have landed at Edfu. We will be visiting another temple today, but first breakfast. At the serving counter, I notice foul, a dish made with fava beans. Sarah, my godchild, has a Lebanese boyfriend whose mother makes wonderful foul. I have to try it. It's delicious. "But it says in the program that we can have an Egyptian cooking class with the chef as an alternative morning program." This is news to him, but he agrees to check with the chef. He comes back and says, "The cooking class will be early this evening. That way you can do the entire program today." Mohammed wants to make sure that I learn the difference between a temple and a tomb. 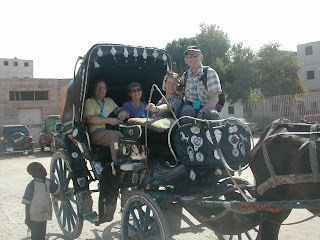 We leave the ship, only to enter horse-drawn carriages. 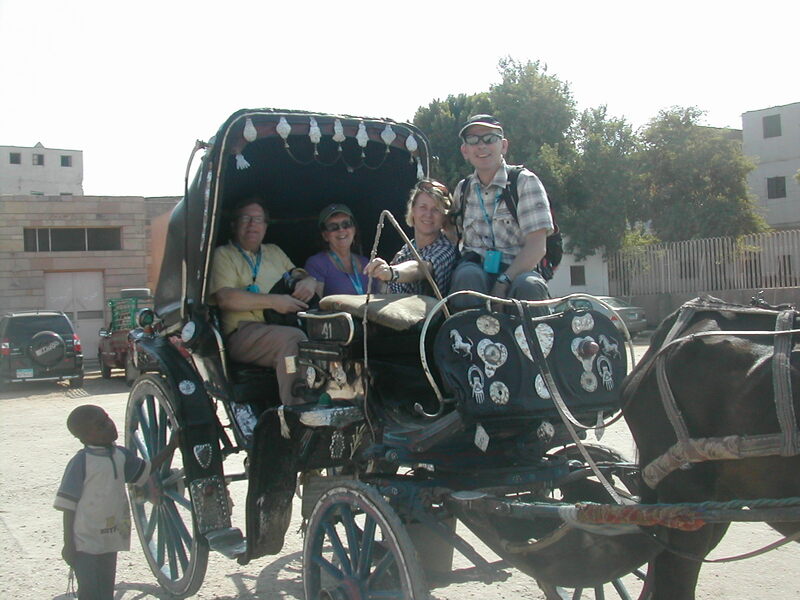 Two couples per carriage. We end up with Claudia and Burkhard and share observations all the way to the temple. I notice the driver whipping the poor horse all the way. Claudia, sitting facing the horse, notices that the horse is terribly skinny. "Baby in horse," the driver says, as he lashes her. Edfu Temple is much smaller than the one we saw at Karnak. "This is the most complete of all the temples in Egypt," says Mohammed. "Here you get an excellent idea of what the temples looked like. This temple," he continues, "is dedicated to the god Horus. That's the falcon you see everywhere. Every temple has several gods portrayed in it, but each temple is dedicated to only one of them. This is the temple in all Egypt for Horus." 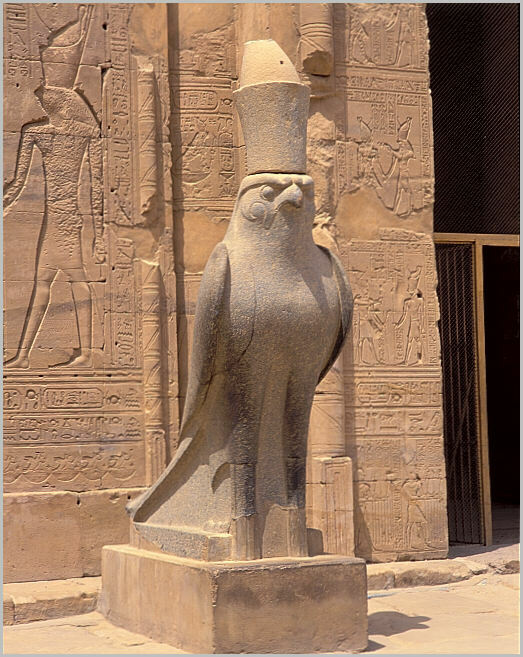 Horus, the god above everything else, hence the falcon shape. One eye represents the moon and the other the sun. When he flies, they move with him. This is the deity the pharaohs usually identified with the most, even equating themselves with him. He turns again to the group. "Frau Nanz, I have a story for you about him. You will see mercy." He hasn't forgotten what I told him yesterday. We enter the temple. It is so beautiful, so perfect! As we stand in the outer court, we gaze into the next-most inside court, the hall of columns. At the end, like the end of a little train, nestles a small enclosed room, much like a tomb. But this is the holy of holies, where only the priest was allowed to enter. Ah-ha! So this must be similar to how the temple in Jerusalem looked. My eyes are opened. They are opening to the connection between religions. The Egyptians had a version of the ten commandments, they had a god above all other gods, they had creation stories similar to ours. I'm beginning to see a much bigger picture. We're all connected! We all know, somehow. And it's the truth behind the story that counts more and more for me, not the veracity of the story itself. My world is expanding, but my certainties are also changing. I'm not sure they're reducing, but they're definitely changing. I'm also beginning to feel more and more sick. The foul is starting to move up my stomach, into my throat. I can't wait to get back to the boat, into my nice Egyptian cotton sheets. I sleep through lunch, floating along with the boat in my dreams. I feel cradled, like Moses in the bulrushes. I hear voices in my sleep, male voices singing. It is beautiful! It is the call to worship. I worship my big, gigantic God from the comfort of my bed. 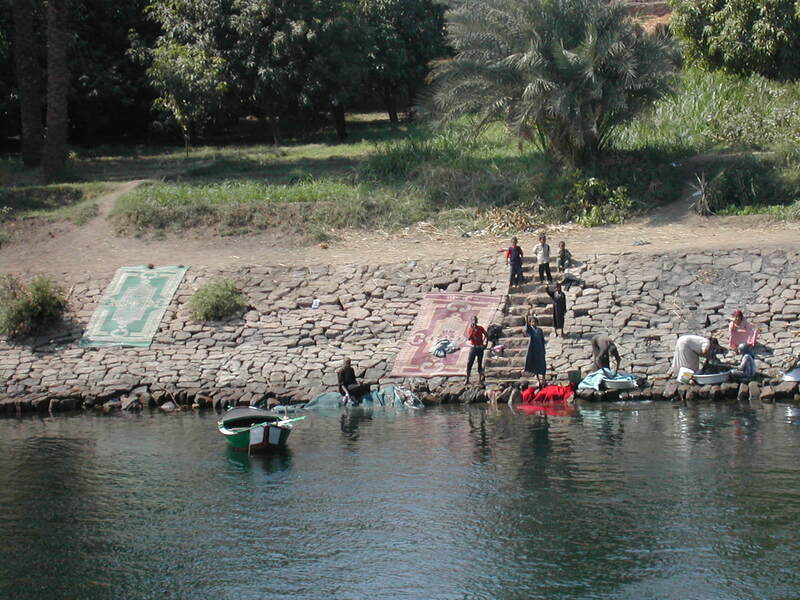 When I awake, I join Peter on our little balcony, watching the Nile and all the friendly people living on its shores pass by. We land at Kom Ombo. Another temple to visit. But I'm feeling more and more queasy in my stomach. Will I be able to cook this evening? I join the others, but am not really concentrated. Then I walk back to the ship alone. No one bothers me in this town. I feel safe. Omar, the chef, greets me with a big smile and a chef's hat. "What would you like to do?" he asks. I don't know, although I had mentioned making foul to him. He gives me a tour of the kitchen. It's huge! There are several freezers and walk-in refrigerators. We make tahini sauce together. He shows me how to make foul. I have to taste everything they show me. It's hard to swallow. All the men on the kitchen staff are so friendly to me, eager to show me what they are preparing for our Egyptian evening. I've been looking forward to this evening since the beginning of the cruise, but I wonder if my stomach will welcome this food. At dinner I manage to get a few bites of tabouleh and a pastry down. A bit of rice. I bite into a falafel and my stomach lurches. I'm going to be sick! I dart from the table, running, looking for a place to throw up. There is only a bowl in the serving line with a spoon resting in it. I throw everything I've eaten this trip into the bowl, too small for the contents of my stomach. It spills onto the floor. I wish I could crawl under it. I am dying of embarrassment. "I'm so sorry," I gasp, as a waiter holds a cloth napkin next to my mouth. I try to go upstairs, but my stomach has more to empty. Peter is at my side as I am sick again. We finally manage to get up to the room. "I'll bring you tea," promises the waiter. 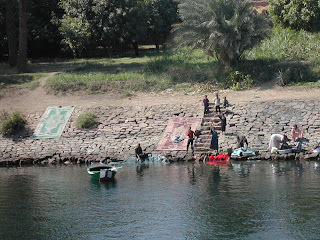 "When we land in Aswan, I'll get you medicine," promises the receptionist. I am so embarrassed, but I feel enveloped in my embarrassment by kindness. I am being shown mercy. I think Egyptian Muslim men do understand kindness. I sip my tea in my room, thinking about all the kindness I have been shown. A fellow passenger brings homeopathic globules to settle my stomach. I go to sleep, nestled in my soft sheets, surrounded by kindness.